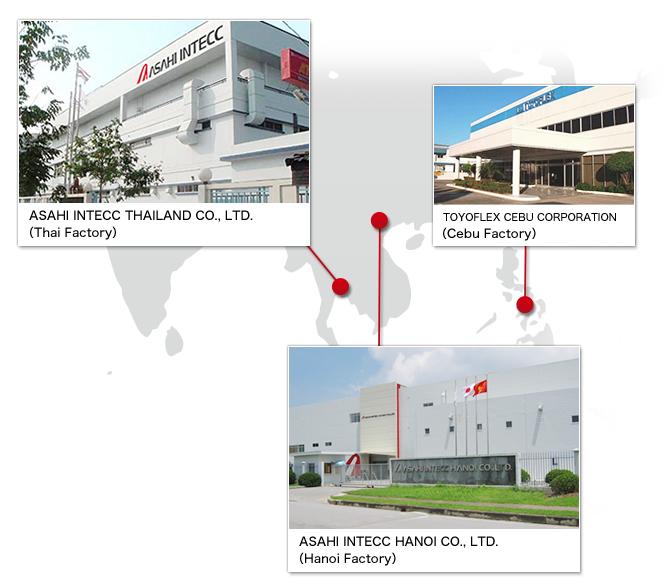 Production System - TECHNOLOGIES | ASAHI INTECC CO., LTD.
We promote low-cost operations through a mass production system at our overseas manufacturing bases. In order to accurately respond to the needs of our clients, Asahi Intecc aims for powerful R&D capabilities and advanced mass production technologies through the fusion of R&D and production technologies. The Thai Factory, Hanoi Factory and Cebu Factory serve as the mass production bases. Several thousand excellent staff are working at these dedicated medical factories where quality control systems based on ISO and the latest facilities are introduced. As production bases of medical devices which deal with precious human life, high-level air checks are implemented at the working spaces to maintain a clean environment. A strict inspection system is put in place at the production lines which includes load inspection of products and micron-level checks of curves and lubricity of wires. Only products that have passed these strict quality control tests are sent into the market.